Grouse are a group of birds from the order Galliformes. They are often considered a family Tetraonidae, though the American Ornithologists' Union and many others include grouse as a subfamily Tetraoninae in the family Phasianidae. 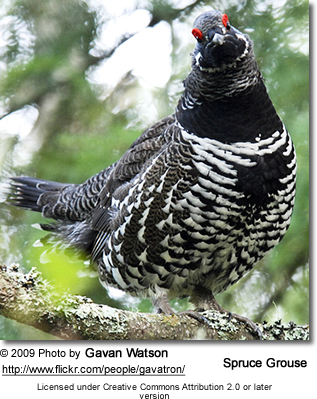 Grouse inhabit temperate and subarctic regions of the northern hemisphere, from pine forests to moorland and mountainside, from 83° North (Ptarmigan in northern Greenland) to 28° North (Attwater's Prairie Chicken in Texas). Presumably they evolved in this zone. 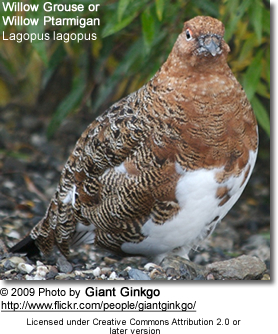 Grouse are heavily built like other Galliformes such as chickens. They range in length from 31 cm (12 in) to 95 cm (37 in), in weight from 0.3 kg (11 oz) to 6.5 kg (14 lb). 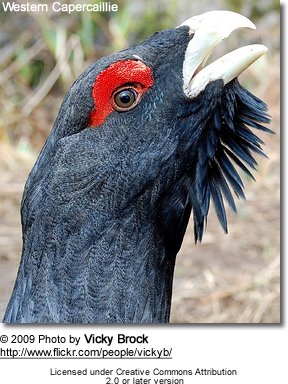 Males are bigger than females—twice as heavy in the Capercaillie, the biggest member of the family. Grouse have feathered nostrils. Their legs are feathered to the toes, and in winter the toes too have feathers or small scales on the sides, an adaptation for walking on snow and burrowing into it for shelter. Unlike other Galliformes, they have no spurs. These birds feed mainly on vegetation—buds, catkins, leaves, and twigs—which typically accounts for over 95 percent of adults' food by weight. Thus their diet varies greatly with the seasons. Hatchlings eat mostly insects and other invertebrates, gradually reducing their proportion of animal food to adult levels. Several of the forest-living species are notable for eating large quantities of conifer needles, which most other vertebrates refuse. To digest vegetable food, grouse have big crops and gizzards, eat grit to break up food, and have long intestines with well-developed caeca in which symbiotic bacteria digest cellulose. 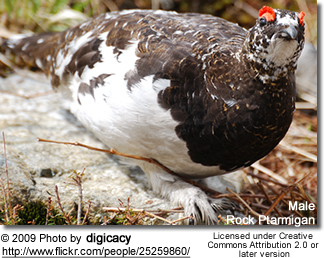 Most species stay within their breeding range all year, but make short seasonal movements; many individuals of the Ptarmigan (called Rock Ptarmigan in America) and Willow Grouse (called Willow Ptarmigan in America) migrate hundreds of kilometers. 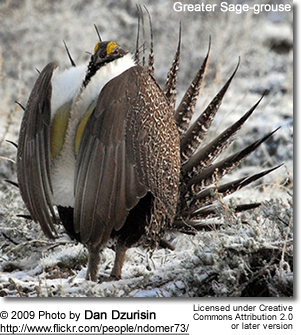 In all but one species (the Willow Grouse), males are polygamous. Many species have elaborate courtship displays on the ground at dawn and dusk, which in some are given in leks (courtship / dancing grounds). The displays feature males' bright-colored combs and in some species, bright-colored inflatable sacs on the sides of their necks. The males display their plumage, give vocalizations that vary widely between species, and may engage in other activities such as drumming or fluttering their wings, rattling their tails, and making display flights. Occasionally males fight. The nest is a shallow depressions on the ground, often in cover, with a scanty lining of plant material. The female lays one clutch, but may replace it if the eggs are lost. She begins to lay about a week after mating and lays one egg every day or two; the clutch comprises 5 to 12 eggs. The eggs have the shape of hen's eggs and are pale yellow, sparsely spotted with brown. On laying the second-last or last egg, the female starts 21 to 28 days of incubation. Chicks hatch in dense yellow-brown down and leave the nest immediately. They soon develop feathers and can fly a little before they are two weeks old. The female (and the male in the Willow Grouse) stays with them and protects them till their first autumn, by which time they reach their mature weight (except in the male capercaillies). They are sexually mature the following spring but often do not mate until later years. The three tundra species have maintained their former numbers. 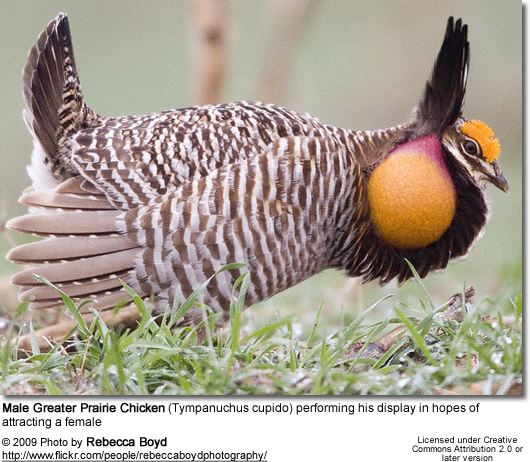 The prairie and forest species have declined greatly because of habitat loss, though popular game birds such as the Red Grouse and the Ruffed Grouse have benefited from habitat management. 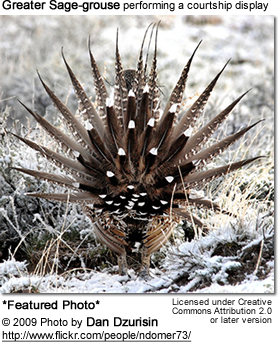 Most grouse species are listed by the IUCN as "least concern" or "near threatened", but the Greater and Lesser Prairie-Chicken are listed as "vulnerable" and the Gunnison Sage-Grouse is listed as "endangered". 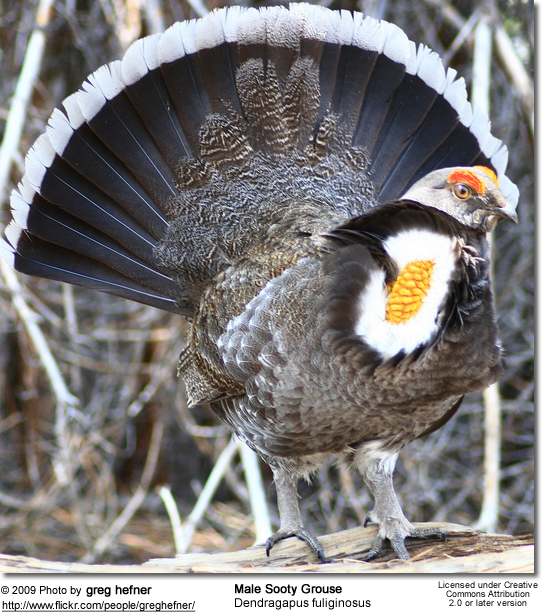 Some subspecies, such at Attwater's Prairie-Chicken and the Cantabrian Capercaillie, and some national and regional populations are also in danger. Grouse are game, and hunters kill millions each year for food and sport. The male Black Grouse's tail feather are a traditional ornament for hats in areas such as Scotland and the Alps. Folk dances from the Alps to the North American prairies imitate the displays of lekking males.